Some of the brightest nebulae are found close together in the winter sky in the Northern Hemisphere. Taurus leads Orion up over the eastern horizon, both constellations distinctive with their bright stars and prominent shapes. Taurus is notable for the V-shape that forms the bull’s head along with the little star cluster known as the Pleiades. Orion is famous for its belt and the three stars that lie tightly in a row, outlined by a large rectangle that makes up the Hunter’s body. The two constellations contain some of the easiest nebulae for amateur astronomers to see. Taurus is home to the first object famed astronomer Messier recorded. M1, also known as the Crab, is found near the horns of the bull. Taurus’s V-shaped head extends back to two bright stars, Aldebaran, the brightest, and Zeta Tauri, at magnitude 2.9. The Crab Nebula lies approximately 1 degree from Zeta Tauri, toward Aldebaran. It is 6,500 light-years from Earth. The Crab Nebula is the remnant of a supernova that Chinese astronomers observed to have exploded in 1054 A.D. The supernova was so bright it was visible in the daytime sky for weeks and visible in the nighttime sky for almost two years. The nebula resulting from this explosion was first observed in the 1700s. The 8.4-magnitude nebula is made of the material that exploded outward in the supernova. M1 is visible in binoculars and appears as an oval haze through small scopes. Large-sized telescopes may reveal some of the filament structures in the gas cloud. For a challenging nebula in Taurus, try the Merope and Maia Nebulae in the Pleiades star cluster. The star cluster is easy to find, just northwest of the Hyades cluster of Taurus’s head. The Merope and Maia Nebulae require a telescope and excellent conditions. The Orion Nebula is perhaps the most well-known nebula in the sky. Also known as M42, the Orion Nebula is bright and easy to find in the constellation Orion. At magnitude 4.0, the Orion Nebula can be spotted without any optical aid. It lies in the middle of the sword stars hanging from Orion’s belt. A pair of binoculars improves the view and a telescope will show its cave-like shape. Four stars lie at the heart of the nebula and are known as the Trapezium. The Orion Nebula is a stellar nursery expelling material lit by the hot, young stars. The stars and nebula lie 1,500 light-years away. Another nebula nearby in Orion is M78. M78 lies close to the three belt stars in Orion, three degrees to the northeast in the direction of Betelgeuse. The magnitude-8 nebula lies at a similar distance from Earth as the Orion Nebula and is considered part of the same complex. 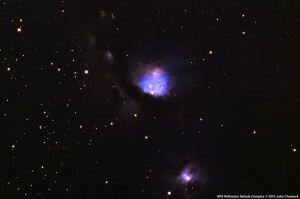 M78 is a reflection nebula with a shape similar to the Orion Nebula. It also appears to be hooded, with a dark line curving across the bright reflected area. Although the nebula is visible through binoculars, a telescope makes catching the object much easier. Larger telescopes and dark skies will reveal other nebulae in the field of view.